I'm not in the habit of taking pictures of myself but it made me chuckle as to how cold it was in the workshop that I had take a pic! Sanding of the ribs was done so back in the house to lay them out, just because! When discussing the plans with Mark, he had suggesting making the rear a bit thicker. I had assumed that the ribs at the back would be the higher numbered ones but I got it wrong! I'm going to do it all as original size and may add some spacers later. So the next thing was that I've ordered some glue! 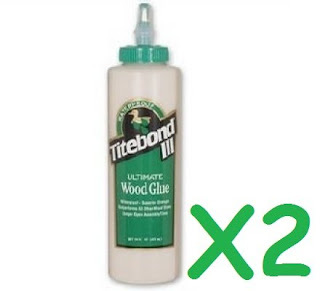 Titebond III, to be specific. I've bought two pots from Amazon but I'm expecting that I might only use one. So the cost there was £18.45 for the two however I used a £15 voucher I earned via Swagbucks by doing surveys and searches so I'm calling it £3.45 as an expense. I've also bought some plywood for the stringers. I went to Wickes and bought a sheet of 5.5mm external plywood at £16.99 for a 2440mm x 1220mm sheet. I drive a Toyota Yaris so it's too wide to fit in my car so I took the templates and a saw with me and sliced a section off in the car park. Sawing long floppy plywood in a car park with no workbenches is not easy but it did save me having to buy multiple smaller sheets which would have been significantly more expensive. I also made sure to buy a sheet that had been stored flat and also went 6 sheets into the stack so it had been compressed for a while. The length in my car was just ok because I could bend the sheet to fit and still close the boot! Length on the templates is too short but I knew that would be the case. I will have an overlap of two pieces per stringer which in my head I had put in the middle but I now think I'll just put a shorter section at the ends.